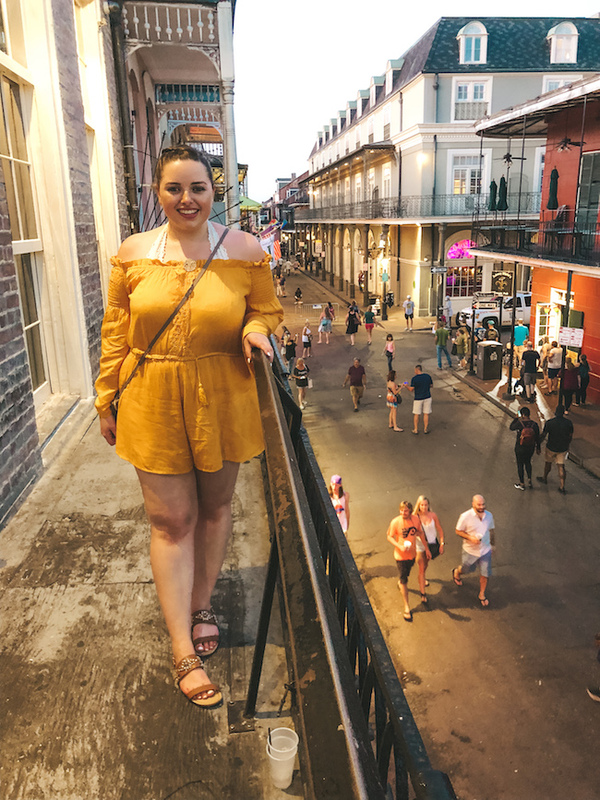 A few weeks ago I traveled to New Orleans for the third time! This was actually my first time traveling their during the summer, so I definitely got to understand the heat and humidity of the South! To be honest, it wasn't at all as bad as I was expecting. I actually kind of enjoyed it, maybe that's just me missing the sun since moving to Seattle! I was there accompanying my best friend and roommate Steph to the National Athletic Training conference, and surprisingly there were so many college friends that went as well! It turned out to be such a fun trip, and slightly different from the times I went before. 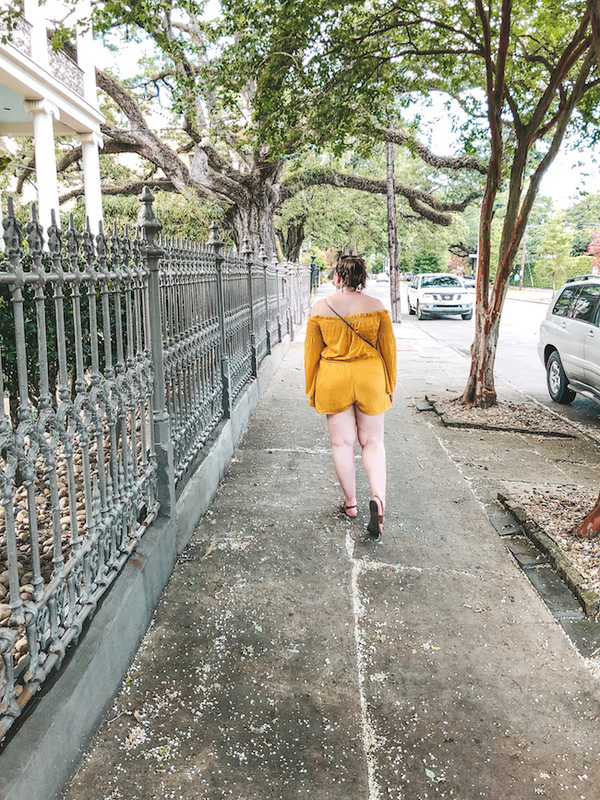 If you haven't already, check out my full New Orleans travel guide, because I'll mostly be doing a recap rather than a guide in this post! But the guide has SO MUCH INFO and I literally share it with everyone who talks about visiting! It's got places to stay, things to do, things to eat and drink, excursions, and more! Okay enough on that, here's what I got into on this visit! Sucré is a bakery that I've been to every single time I go to New Orleans. I think we visited 3 or 4 times this trip alone, the desserts are just that good! 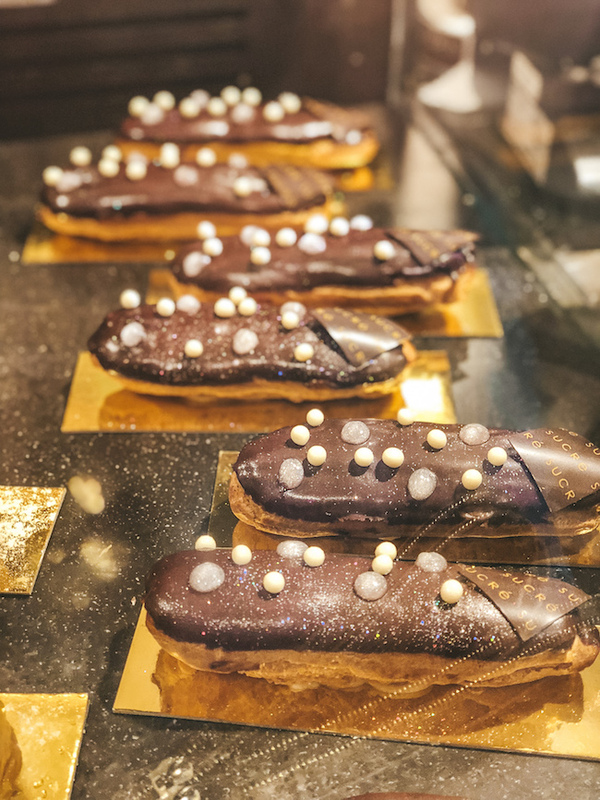 I tried the eclair, which was voted best eclair in the world last year by a magazine I can't remember, haha. It was pretty good, although world's best is still to be debated. World's prettiest for sure, just look at those sparkles and glitter dollops! They also have a ridiculous amount of macarons, and although they aren't my favorite my best friend loved them. Another thing I really wanted to do again was take a swamp tour. I did this my first trip, but it was in January so all the alligators were basically hibernating. This time around was the complete opposite! We saw 5 or 6 gators and they were all so active! Our boat driver and tour guide actually spoke to the alligators in french, and y'all they LISTENED. 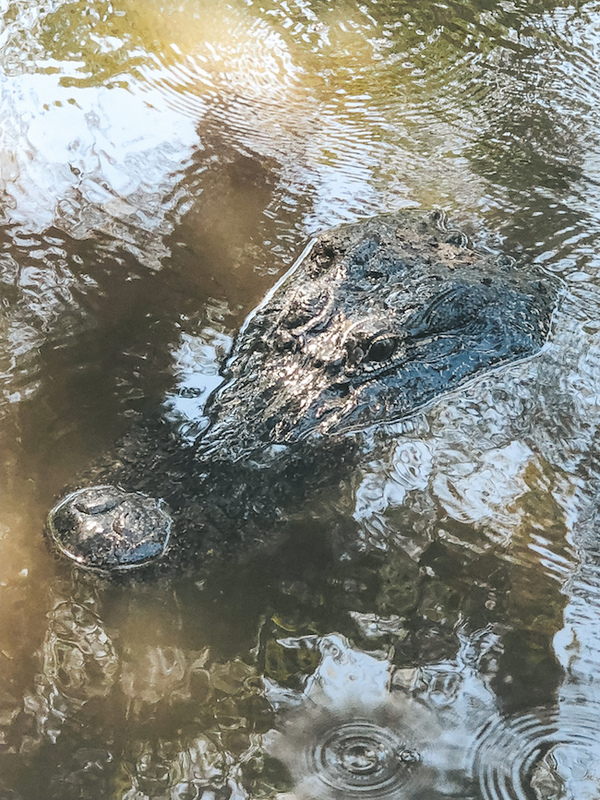 One of the alligators swam away to chase a little one out of his territory, and our guide yelled at him to leave him alone and come back to the boat and he immediately turned around and came back. It was insanely cool and also kind of terrifying. 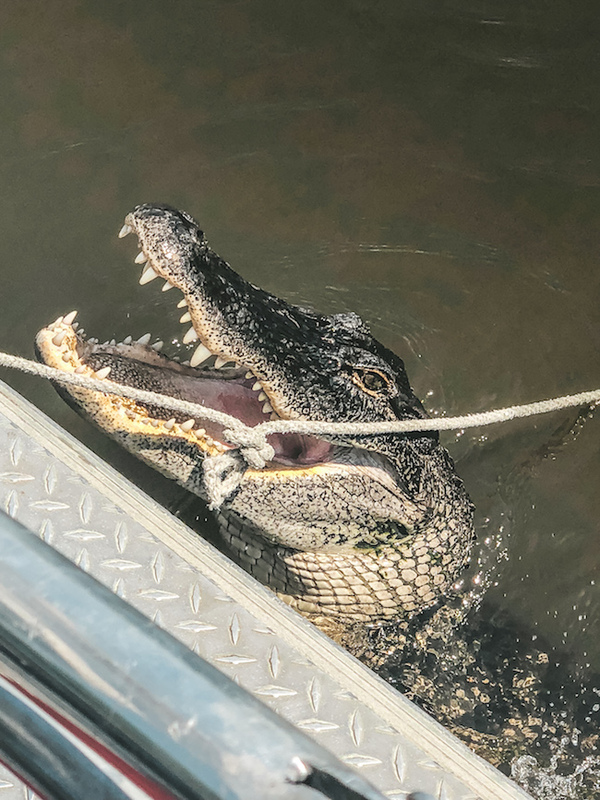 The alligators weren't afraid of us at all, and swam directly up to the boat, one even tried to get on! Our guide kept them busy by tossing marshmallows at them, who knew alligators liked to eat marshmallows! Overall it was super fun, and I just loved getting to ride into the swamp. 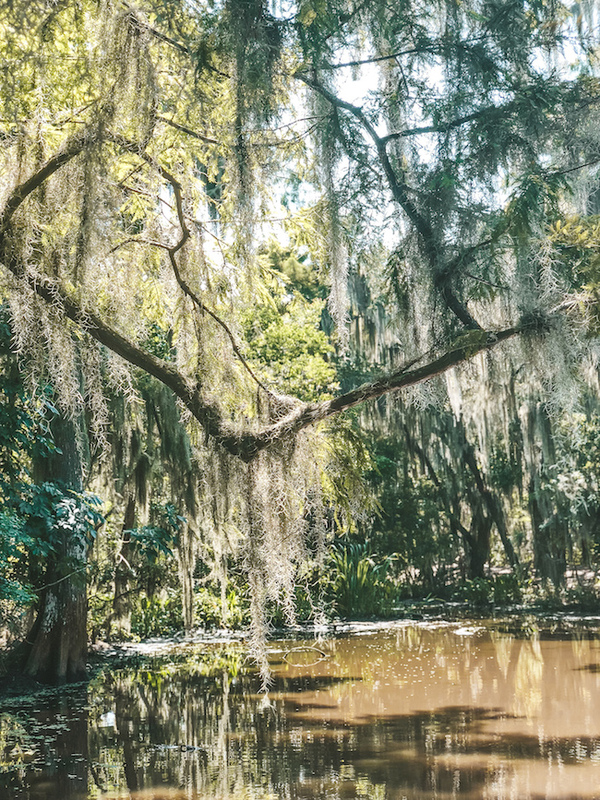 Part of me weirdly felt at home when flying through all the spanish moss and overgrown trees. It was soothing and beautiful in such a unique way. We went with a company called Airboat Adventures, the same company I had taken before, and I can't recommend them enough! Okay I promise I wore different outfits on this trip, these photos all just happened to be taken on the same day! Steph and I's school was having an athletic training reunion-type party at one of the bars on Bourbon street so I tagged along even though I'm not an athletic trainer, because I likely would know most of the people there anyhow. It ended up being a little reunion of some friends, and I was so excited to finally get a photo of myself on a Bourbon balcony! Last and certainly not least, I ate to my heart's content in New Orleans. 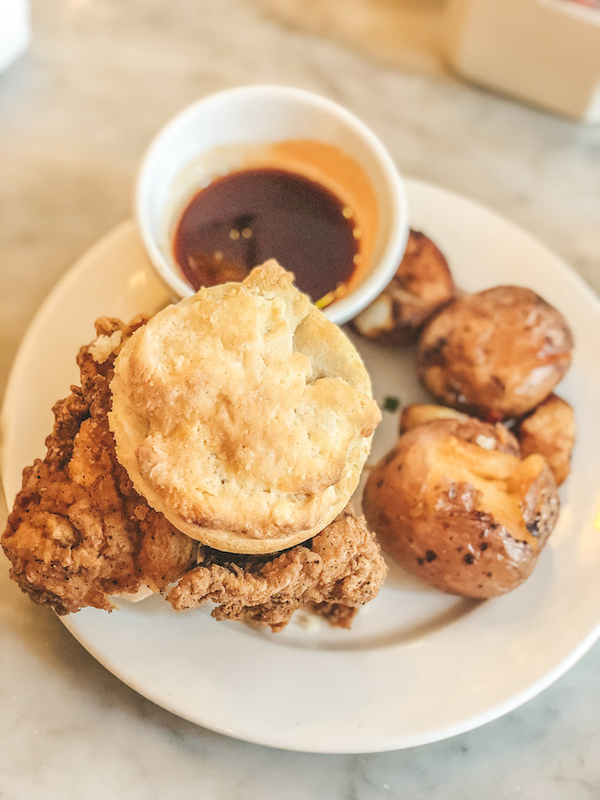 Above is the chicken and biscuits brunch from Bourbon House, the restaurant attached to the hotel we stayed at. These biscuits were honestly to die for they were so good! 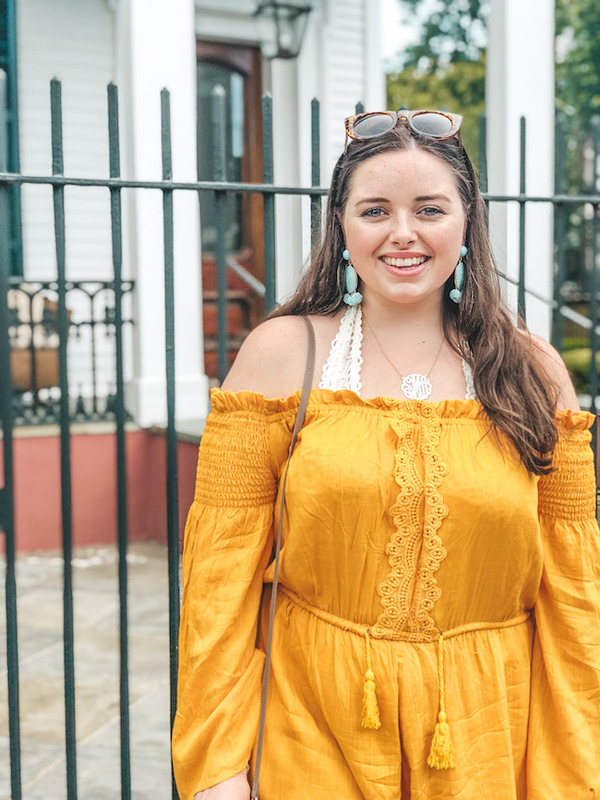 If you're wondering what other restaurants I love in NOLA definitely check out my Travel Guide because it's full of them! Have you ever been to New Orleans? What are your favorite places to travel? Love the bright colors on your photo. New Orleans seems wonderful, I didn’t even know you could og on a swamp tour there, seems cool. Glad to hear that you didn’t get eaten by the alligators. There are so many places I wanna go, just gotta take them one by one. Thank you! And NOLA is the best! I highly recommend the swamp tour, it's technically a half hour outside of New Orleans, but it's my favorite thing to do when I visit! This is one of my favorite places to go!!!! By chance, did you go to Port A Call? Best burgers in U.S + the drinks will take you from 0 to 100 in like 3 minutes. Glad you had a blast on trip. I didn't! I will have to put it on my list for next time I'm there! And oh yeah so many of the places have drinks like that, haha! Sami you took such STUNNING travel photos!! 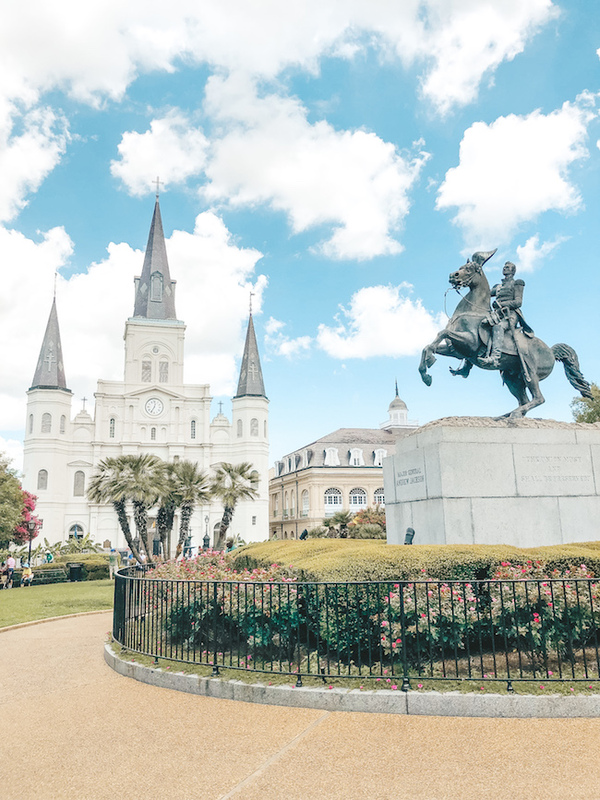 New Orleans is definitely on my travel bucket list- I've never been to Louisiana! Thank you Annaliese! And you need to go! I have so many recommendations for you if you make it there! Your pictures are amazing! I've wanted to visit New Orleans for so long, definitely on the bucket list. Oh thank you! And yes you have to go! I was fortunate enough to attend a wedding a few years ago that was on the first day of Mardi Gras. I've never had so much fun in my life. We all got to walk in the parade with a band and mummers and it was insane. While we were there we took tours of the churches and of the cemetery where Nicholas Cage purchased his burial plot (super weird pyramid like National Treasure). I go to NOLA once a year (next up is over Labor Day Weekend!) and I agree--the Swamp tours are SO FUN! Next time you go, take a voodoo tour from the free walking tours and ask for Robi. It is AMAZING. Hands-down favorite thing we do in New Orleans every year. NOLA is my home and I miss it all the time. The food is so good haha. I love your mustard romper! Would love to visit New Orleans some day! 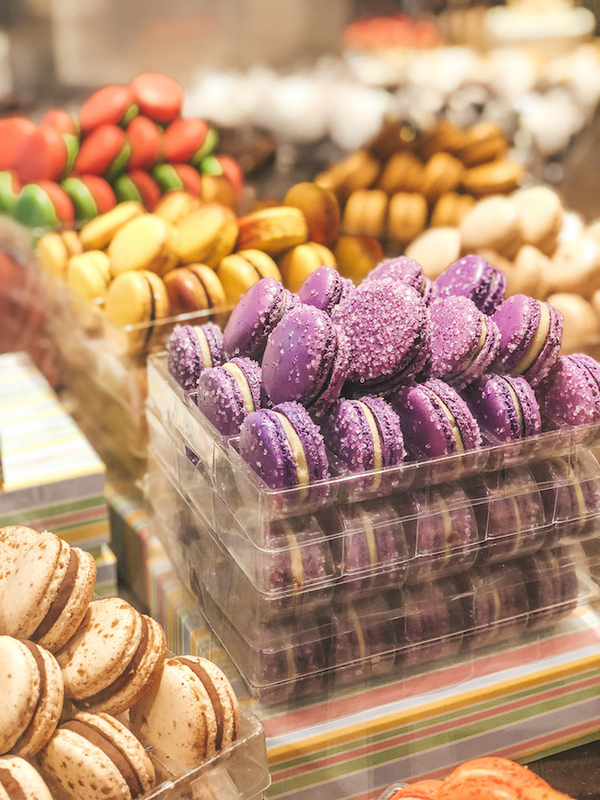 I love those macarons. It looks so good and yummy! I also love your yellow mustard dress. I wish I can visit New Orleans soon. I love NOLA I'm planning a girls trip there next fall! Oh wow, I have always wanted to go to New Orleans! What an awesome trip - the desserts seem so yummy! Prerana | Broadcloth - Fashion you can wear to work. oh this looks so fun!!! I have never been there before I don't really tend to go to cities though I like the outdoors to much lol! would love to go one day though. Um that swamp tour sounds AMAZING. I'd be terrified though of the gators trying to get on. I may be biased, but Nola is the best city!! Sounds like you had a good time! This makes me want to go on another swamp tour. I'm ashamed to admit that I haven't been on one since a field trip in middle school!